New Jersey Probate, Estate Planning & Administration - (732-634-5512) How Does Divorce Impact An Estate Plan? Timothy J. Little, P.C. New Jersey Estate Planning & Administration: How Does Divorce Impact An Estate Plan? It is ordinarily suggested that a client modify his or her estate planning documents in the event of any significant life events including, but not limited to, relocation to another state or country; changes in financial circumstances; changes in tax laws; changes in relationships; the death, disability, or incapacity of any designated beneficiary or fiduciary; and marriage or divorce. However, oftentimes a divorcee will fail to modify his or her Last Will and Testament or insurance policy beneficiaries at the conclusion of the divorce proceedings – what happens in the event that the existing Will benefits the ex-spouse or names the ex-spouse as a fiduciary? Fortunately, New Jersey has a statute that addresses this circumstance and potentially limits the repercussions for failing to modify an estate plan. Pursuant to N.J.S.A. 3B:3-14, “except as provided by the express terms of the governing instrument, a court order, or a contract relating to the division of the marital estate,” a divorce or annulment serves to revoke any revocable disposition benefitting the former spouse (including by way of Last Will and Testament or life insurance policy), and revokes the nomination of the ex-spouse as Executor or Executrix. At the time of the divorce or annulment, provisions of the “governing instrument” are treated as if the former spouse, and relatives of the former spouse, disclaimed any disposition of property or, in the event of an appointment as fiduciary, the ex-spouse and any relatives died immediately before the divorce or annulment – pursuant to case law, evidence of contrary intent is irrelevant in the event of a challenge to the revocation. Furthermore, pursuant to the statute, the interest of the former spouse in property held by them as joint tenants with the right of survivorship or as tenants by the entireties is severed, and the interest is transformed into a tenancy in common. It is important to note that, in the event that any provisions in the governing instrument are revoked under the statute, they may be revived by a remarriage between the divorced parties, or by a revocation, suspension, or nullification of the divorce or annulment. Additionally, in the event that the ex-spouse is benefitted by a document executed after the divorce, he or she may still benefit from the deceased spouse or serve as a fiduciary. It is also important to note that a divorce or annulment does not nullify dispositions made pursuant to a qualified retirement plan; for example, in the event a beneficiary is designated for a 401(k) plan or any type of retirement plan subject to Federal law, such designations are not revoked under the pre-empted New Jersey statute. Litigation will often occur where an ex-spouse benefits from the deceased ex-spouse’s failure upon divorce to modify beneficiary designations for a qualified retirement plan; therefore, it is highly recommended that you evaluate all beneficiary designations and estate planning documents in the event of a divorce. If you have any questions in regards to the divorce process, your Marital Settlement Agreement, alimony, child support, or family law, you may wish to consult with an experienced family law attorney. Similarly, because estate and trust planning, administration, and litigation requires specialized knowledge, you may wish to consult with an experienced attorney if you have questions regarding your estate plan, the probate process, administration of an estate or trust, fiduciary obligations, preparation of a formal or informal accounting, refunding bonds and releases, and the procedures for filing a formal accounting or exceptions thereto. This article is for information purposes only, and is neither legal advice nor the creation of an attorney client relationship. Timothy J. Little, P.C. 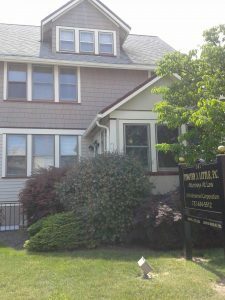 is a full-service law firm with offices in Woodbridge and Chesterfield, New Jersey. Timothy J. Little, P.C. represents individuals, families and businesses throughout New Jersey including Middlesex County (Old Bridge, Woodbridge, Sayreville, East Brunswick, Spotswood, Perth Amboy, Dunellen, Colonia, Sewaren, Iselin, Avenel, Fords, Keasbey, Menlo Park, Port Reading, South Amboy, Monroe, Edison, Carteret, Cranbury, Helmetta, South River, Milltown, Highland Park, Jamesburg, Laurence Harbor), Monmouth County, Union County, Ocean County, Somerset County, and Burlington County.